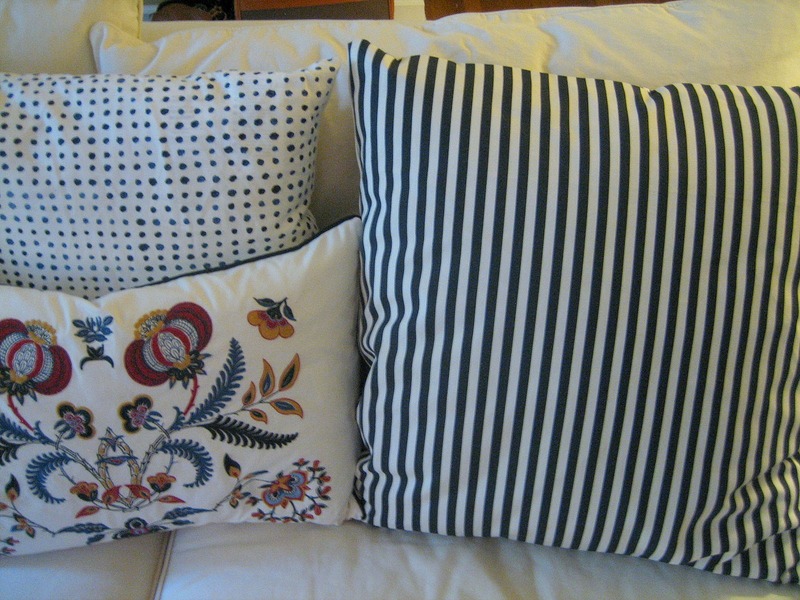 I feel like I've been on the hunt for pillows for my living room for months. Happily, the search is finally over! I know, you may be thinking- woah, that's a looooot of pillows for one couch! 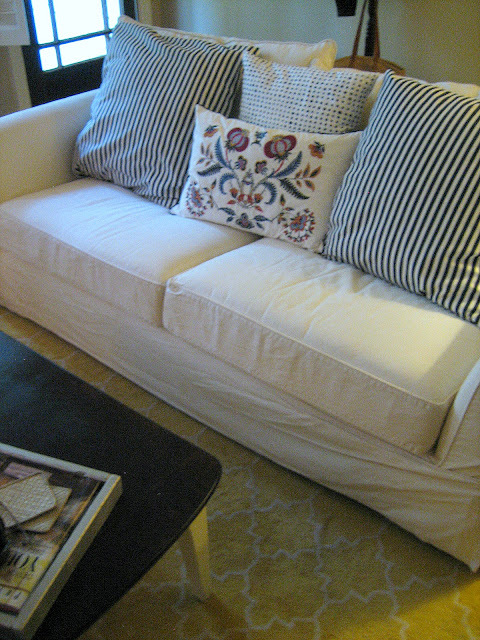 But David's sole decorating request in our home has been that he wants big, gigantic throw pillows for the couch. Big enough to nap on, big enough to throw on the floor and play with the dogs, just big enough. So, gigantic throw pillows is what he got! With a 25 inch square pillow form, I made the navy striped pillows with some discount fabric from Ikea ($6 for two yards, baby). And no, mom, you shouldn't be that proud... 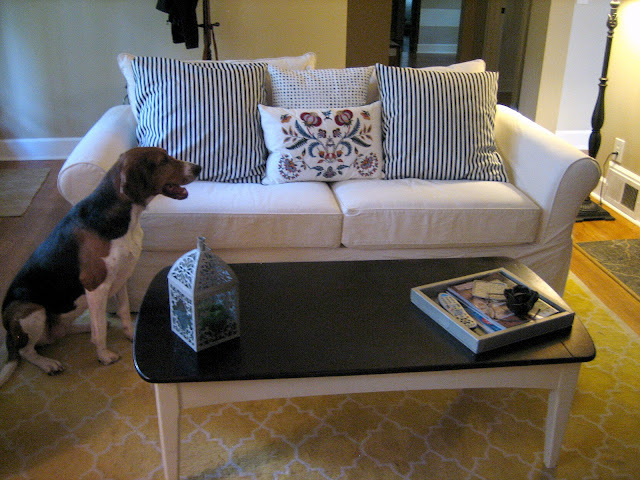 I did it the no sew way, just like I did the curtains in my master bedroom and as Cassie graciously shared with us. Iron on hem tape-- you're a genius. 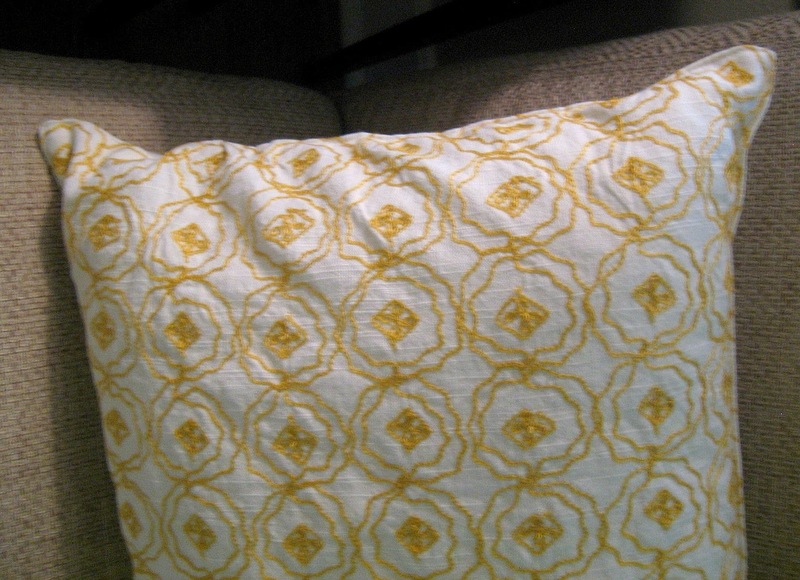 Simply place the fabric with the backing up and iron on the hem tape along the edges of the front (patterned) side, on three sides of the pillow. Picture your fabric backing is facing towards you and the two patterned sides hem taped together. Making sense? I mismatched my stripes up (on purpose) because I'm cool like that. Then turn the pillow case (hooray, it's now a pillow case!) 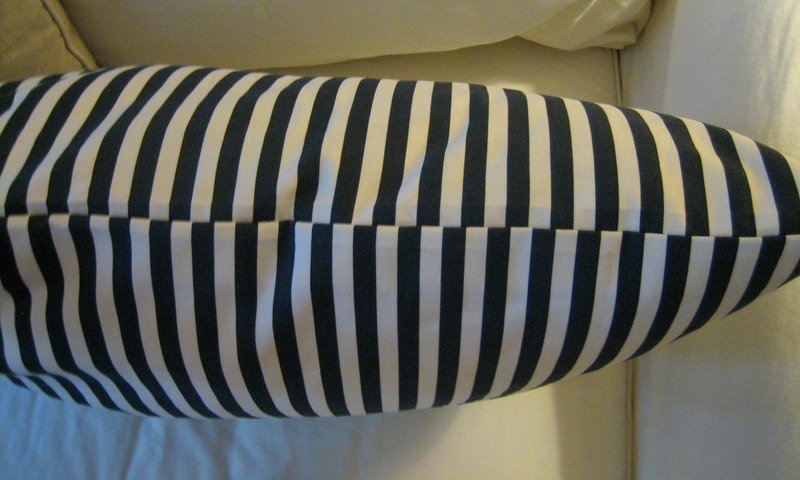 inside out, add in the pillow and seam up the last edge. This was honestly kind of difficult for me- it would probably be best to actually sew up the last edge, which I plan to do eventually for better hold. The other two pillows on the couch are also Ikea. Cheap and fun, I love it. 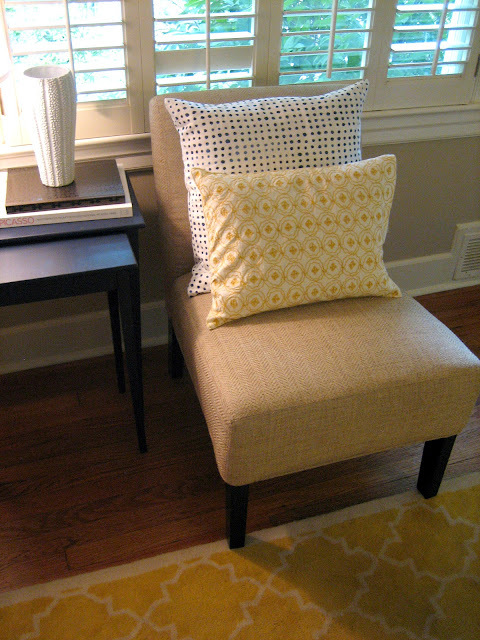 I also no sewed some new tiny yellow pillows for our slipper chairs. Any guesses what these babies are made from? I tried to take a lot of pictures of the new pillow set up, but Maggie wanted to hog the lens. or the squirrel I just saw outside. Being a dog is tough. 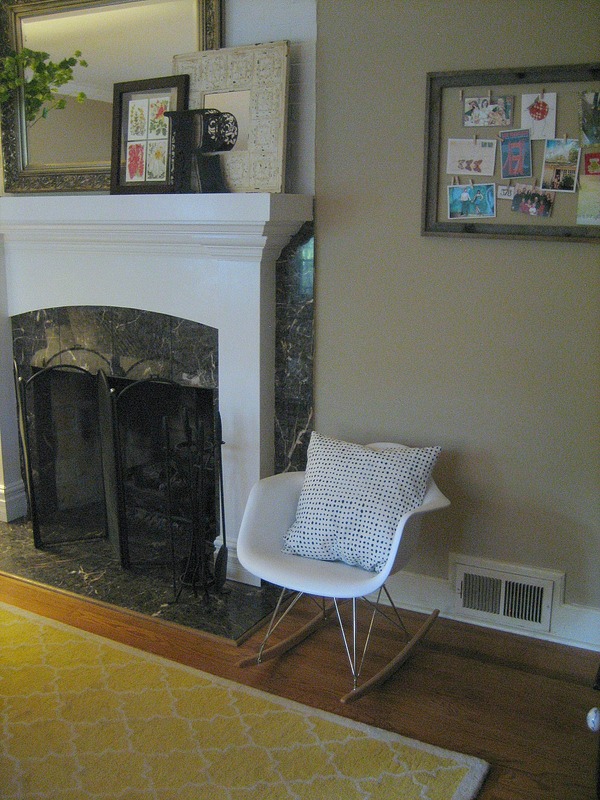 Oh and my coveted Eames rocker got some Ikea pillow love over in the corner! I love the new pillows and the way they tie in with my navy dining room. It's all coming together! LOVE! I need to try this no sew tape. Sounds easy! This is genius! I love it, especially because I don't know how to sew! I love it! Classic blue and white. :) Our houses are actually starting to look quite similiar, except for yours is more blue and yellow while mine is more blue and green. I love the pillows! 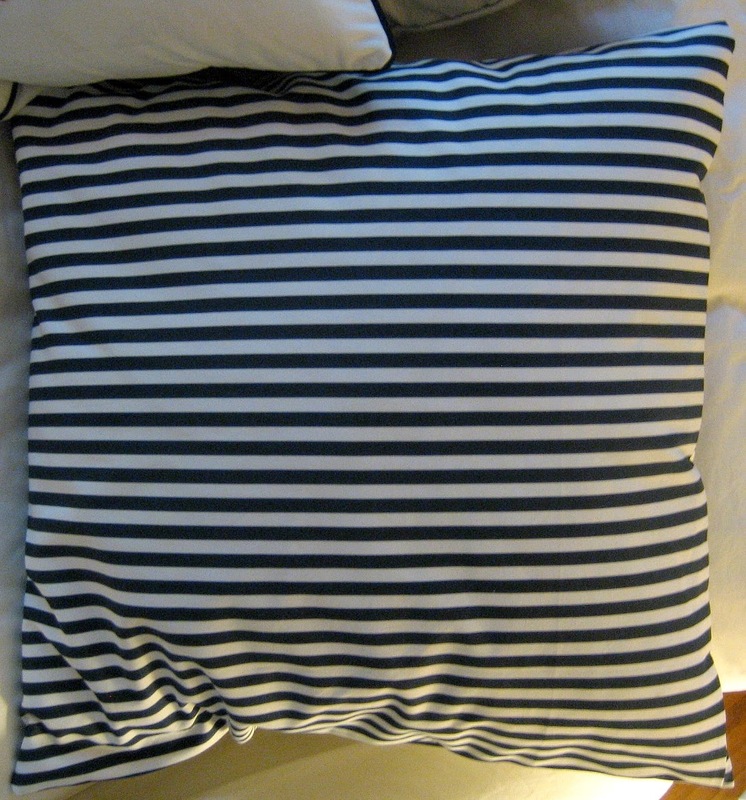 I bought some of the striped navy fabric from Ikea last fall and sewed my own too. Where did you get the beautiful yellow rug from? I'm looking for one similar for my office. Love! 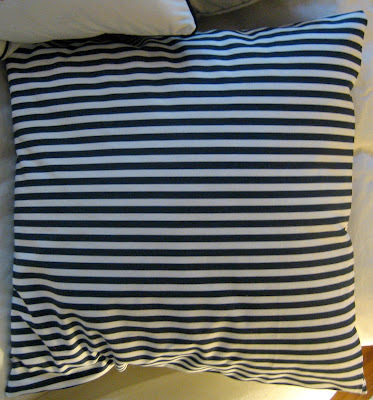 So cute, I love the navy stripes! And I kid you not, that yellow Target placemat? I bought this spring for the express purpose of pillow making too... just haven't made mine still 'cause I'm lazy. Too funny! Adorable. I am making giant ones for our couch right now too. But, hello!!! Placemat pillow. I had no idea you could open them up and make a pillow from them. So genius. Especially as I have a ton of placemats we never touch . . off to look at them. they look great! and yes, I've come to the conclusion that learning to sew is probably easier than the no-sew route on pillows. which means i'll prob never make pillows again. The pillows look great- I LOVE the idea of using placemats as a pillow covering! I love Maggie's thoughts...she is so sweet! Also....loving the yellow pillows made of place mats! You are one crafty lady! They look great! Love all the layered pillows and patterns! Great job! So pretty! I love how they look with your dining room! i love the lotsopillows look! and i love those striped ones! 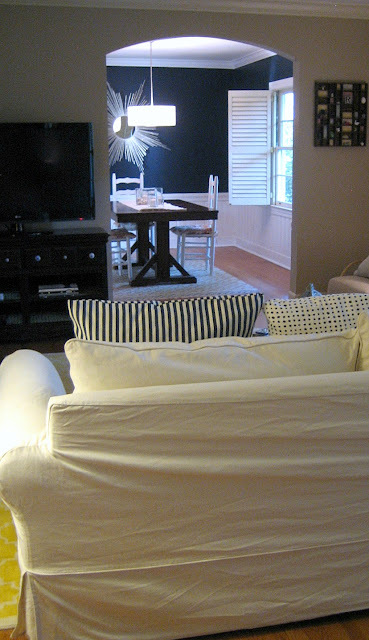 I love the armless chair and the nesting tables next to it. 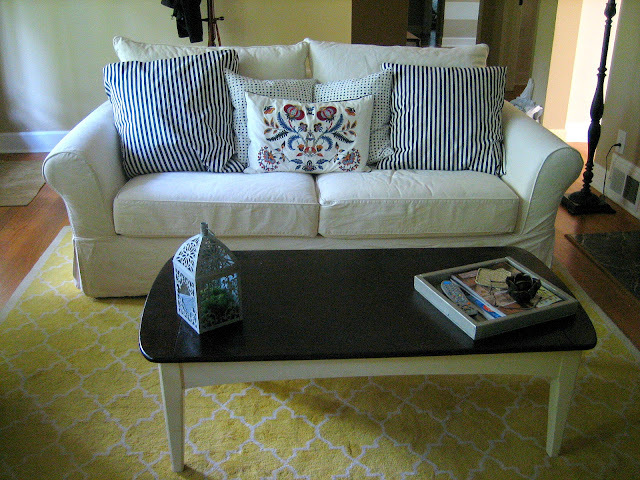 That yellow patterned pillow is perfect, and it does tie together with your dining room. I also love the rug. I think I recognize it from West Elm when I was looking. So nice! Oh my gosh, amazing!!! I have been mourning my lack of sewing skills because I can't find the pillows I want...they only exist in my mind apparently. This is obnoxious but can you do a step-by-step tutorial with visuals? I'm having a hard time picturing it. LOVE them!!! Love the stripes! 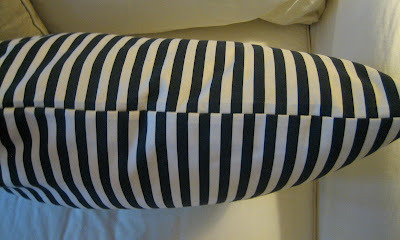 I'm going to try a little no sew pillow of my own soon! Any project with the words "no sew" always catches my attention! Great job - I have to try that!